"At Götrich we tailor every garment bespoke for you"
At Götrich we tailor every garment bespoke for you. For readers unfamiliar with the term bespoke, it comes from the old days of tailoring. When a customer had come in to the tailor to select a piece of cloth for his garment, the cloth had “been spoken for”, that is to say that the piece was earmarked for that particular customer. After that the process of tailoring the customer’s garments began. Every bespoke order starts with the creation of a unique pattern for every single customer. The pattern is generated by means of a measuring tape and an experienced tailor who carefully examines the customer’s three dimensional properties. Are shoulders sloping, do the shoulder blades stand out, does the customer have a pronounced forward belly for instance; these are dimensions that are hard to capture with a measuring tape only. Based on the measurements and observations from the first consultation, a pattern is created on several different pieces of paper so that the cutter can place them onto the cloth and cut out the components. Since some cloths have distinct patterns like stripes or checks, the cutting must follow a strict logic to ensure the best possible pattern matching across the seams. "Based on the measurements and observations from the first consultation, a pattern is created"
At Götrich we continue the process by creating a so-called “toile”. Toile is a French word that means canvas (like the canvas that artists paint on) and is essentially a disposable cloth that is used to ensure that all measurement and dimensions are captured in the right way. During the first fitting you will thus try on a loosely basted prototype of your suit that looks nothing like the end product. During the toile fitting, everything can still be changed since the actual cloth hasn’t been cut. The purpose is rather to see that the garment fits well across the customer’s body and creates just the right amount of air in between the body and the jacket so that it sits nice and clean without creases whilst still feeling comfortable to wear. After the toile fitting is over, the tailor changes the pattern if needed so that the actual cloth can be cut. When the pattern has been confirmed to be just right, the time consuming stitching can begin. 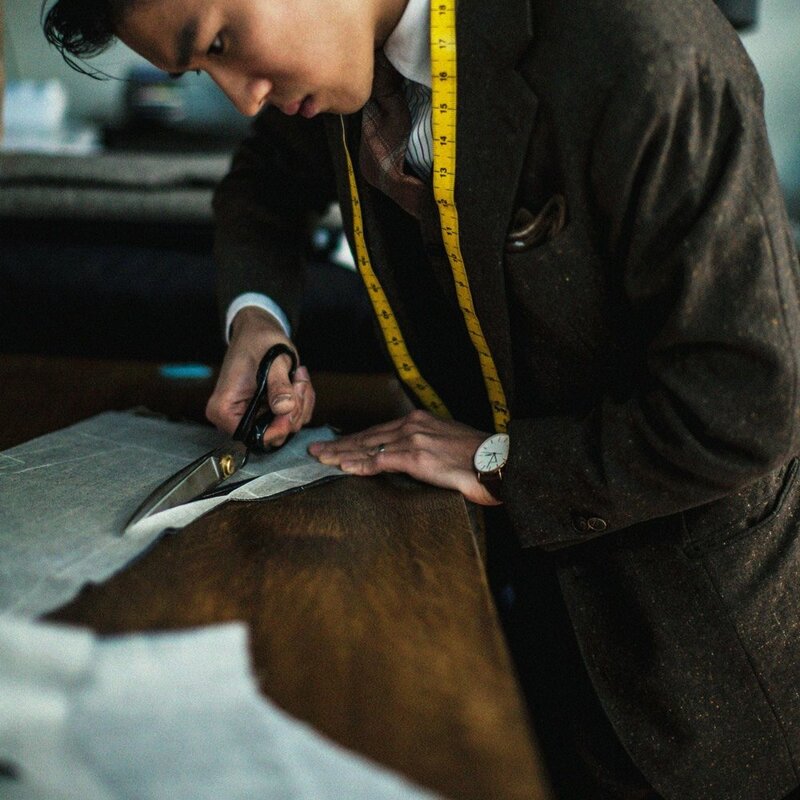 Hand-made suits take more than 50 hours to produce if done in the traditional way, and every hour is well spent time. On the inside of the jacket a canvas fabric is stitched with several hundred small stitches in order to create a three dimensional shape in the jacket’s chest. The shape is crafted by the ever so slight differences in tension in the stitches. A ready-to-wear garment typically doesn’t have the same construction underneath, but rather a fused piece of paper, leading to the loss of shape over time. Buttonholes are made by hand, giving them a lovely embossed structure, and the sides along the lapels and pocket flaps are finished with so-called pick-stitches. Every hand-made detail gives life to the garment and, however subtle, adds to the overall perception of the suit. "When the pattern has been confirmed, the time consuming stitching can begin"
When the suit has been constructed, it is time for another fitting. This time the actual garment in your selected cloth is tried on, so you will now see the suit in real life. Since all cloths behave differently and hand-stitching is a craft rather than a precision exercise, there might still be details that will need alteration; a sleeve might need shortening, a crease might have to be taken out, the trouser length adjusted. For that reason it is likely that a third and final fitting is scheduled after some minor updates. The process from start to finish will take about three months, including all the steps in the process. All of the steps are highly enjoyable and you will really feel involved throughout, but the time lag means that you need to think ahead. You will have to think about your summer suits in winter, your autumn tweeds in spring, and your New Year’s attire in the summer. However, when the garment has been made for you by hand it will last you for a very long time and truly keep its shape (normally longer than its owner!). Anyone getting married this summer or wanting to tailor something for a spring graduation should book an appointment straight away. It is high time to think about everything needed for summer or early autumn. We look forward to seeing you at Linnégatan 75 soon!